Freshman midfielder Alyssa Findlay tries to make a goal on Buckley Field. This season the women's team has silenced the bad predictions by going 2-0 in conference play. The team is set to face William and Mary Oct. 7 in Williamsburg, Va. Temperatures falling, old sweaters making their way out of the storage bin and the lengthening night taking over from the shortening days. These three things can only mean the following in the city of Philadelphia: One, it is October, two, the Phillies are preparing to make another tilt at the World Series, and three, Drexel women’s soccer is entering a crunch run of games that will impact their chances of earning one of the postseason spots in the Colonial Athletic Association. Fourth from the top in the CAA standings — runaway leaders William and Mary (9-1-2, 4-0 CAA) sit atop — head coach Ray Goon’s side has upset one or two predictions. Picked to finish in the bottom of the conference by an early-season poll of the coaches, Drexel has gone about putting together a run of performances that has been a marriage of flair and hard work. A 2-0 start to the conference schedule that included resounding wins against Georgia State and UNC Wilmington saw the Dragons go into their first road conference game against Hofstra with confidence. An early goal for the visiting side by forward Jenna Lindsay quickly pushed the home side onto the back foot. The assist for Lindsay’s goal went to Alex Vasquez with a long pass from midfield. The response was swift from the Pride as a pass from Lulu Echeverry found Laura Green with time and space to dribble through Drexel’s defense and tie the game with a finish past Eve Badana in goal. With the score level and close to halftime, a lightning storm resulted in the game being halted for 52 minutes for safety reasons. Hofstra started better after the restart with Greene once again applying the finishing touch to a pass across the middle from midfielder Courtney Breen. 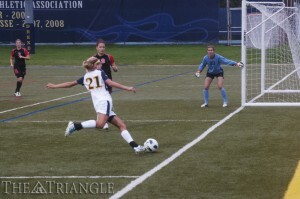 Despite increased Drexel pressure on Kylie Shuster’s goal, the match would end 2-1 with the spoils going to the Pride. Their next match was against a resurgent Northeastern side and saw the Dragons return to the Vidas Athletic Complex, where they boasted an impressive 4-0-1 record going into the Oct. 2 game. The home crowd’s eagerness to see a win was rewarded by a bright start to the game from the home side. A quick interchange of passes saw the lively Jess Lowinger released down the left wing, and a centered cross nearly found Alyssa Findlay in acres of space at the edge of the 18-yard box. Northeastern did manage to clear the ball away hastily. Drexel would soon be back as a slide-rule pass from Findlay released top-scorer Jenna Lindsay down the right wing, her cross finding the forehead of her strike partner Vasquez, who could only angle her header onto the upright. Tiring legs for the Dragons saw Northeastern slowly start to eke out a share of the possession with forward Greta Samuelsdottir looking particularly dangerous when allowed space and time to run at Drexel’s back four. Drexel managed to accrue a lot of possession without quite getting that final touch in the box to test the visiting goalkeeper. The frustration from the home side soon drew its first casualty as a wild tackle from freshman Melissa Chapman saw the first yellow card of the day handed out to Drexel. With three minutes to go, the game took a turn for the bizarre as an innocuous ball into the box saw a Northeastern player hit the deck like a flounder at a Philadelphia fish market. To the amazement of the home crowd and the consternation of the home bench, the referee saw it fit to award a penalty to the away side. Veronica Napoli stepped up to take the effort, which was saved quite comfortably by Badana. The save was a close call for the home side, and a priceless play that would see the game go to the half without anyone troubling the scoreboard. The second half started much as the first, with Drexel dominating possession in dangerous areas of the pitch but lacking that poise in front of goal to score. A reverse pass by Vasquez put Lindsay in behind the Northeastern defense only for her thunderous effort to find the side netting. It was to be the only real goal-scoring opportunity of the second half as both teams showed their more physical attributes, particularly in the 50/50 challenges. The referee dished out another caution, this time to Northeastern’s Lahaina Zoller. Tied 0-0 at the end of regulation and for the second time this season, Drexel would go into overtime looking to win. Their cause was aided again by a massive save from their freshman goalkeeper as a slip on the greasy surface allowed Napoli to get in behind for a one on one opportunity. Badana’s reflexes come into the forefront again as she battered away the resultant shot. 0-0 it would remain through to the end of overtime giving both sides a valuable result in a game that neither could afford to lose. The Dragon’s next game Oct. 7 sees them take on conference leaders William and Mary on the road. Boasting 34 goals scored and only eight conceded in 12 games played, the Tribe has only lost one game at home this season (double overtime to Villanova) and presents a huge challenge to a Drexel side that has yet to find its scoring touch away from home. Junior Mallory Schaffer, who has managed to rack up 11 goals and three assists in 12 games played this season, will lead coach John Daly’s side. She is ably aided by the duo of Emory Camper and Cortyn Bristol, who have scored 10 goals between the two. Shackling this productive triumvirate will be a task that will fall to Drexel’s much-improved defense led by goalkeeper Badana and redshirt junior Jourdan Halasz. The Dragons continue their road schedule with a visit to Old Dominion (5-5-2, 2-1-1 CAA) Oct. 9. The Lady Monarchs come into the game boasting an equal record as the Dragons at this early stage of the season. A 4-4 double-overtime tie with George Mason saw Old Dominion bounce back for a quick two-game winning streak that took wins at home against Towson and UNCW. The Lady Monarchs’ most recent game ended in a four-goal thumping at the hands of Georgia State on the road. Joe Pereira’s side will be looking to return to winning ways at home. As the conference table starts to take shape at this critical point in the season, Drexel will be looking to get over its road hoodoo and finally pick up some points this weekend. With most teams in the conference struggling to win on the road, anything the Dragons manage to pick up will count doubly come the end of the season.